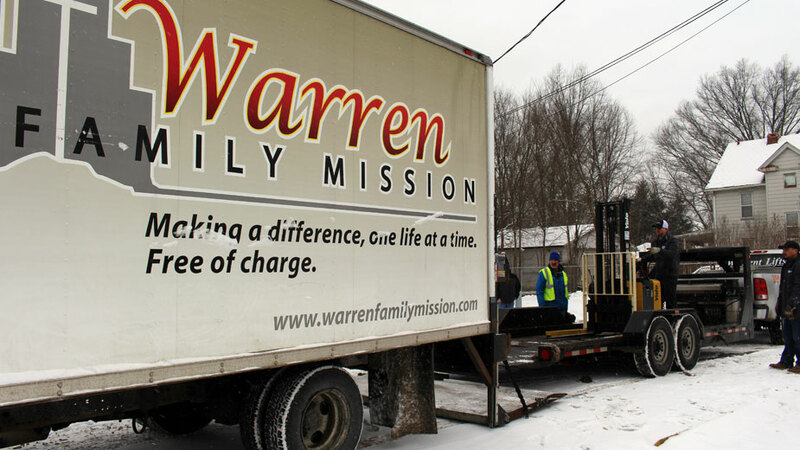 WARREN, Ohio — Workers at the Warren Family Mission will have a much easier time unloading trucks with its latest donation: a 4,000-pound-capacity fork truck courtesy of Direct Forklift and Equipment Co. in Boardman. The mission brings in 10,000 pounds of food weekly at its new distribution hub at 1312 West Market Street, said Dominic Mararri, director of public relations. Food is delivered on grocery pallets that, until now, workers had to unload on the ground floor and slide up the stairs to the main storage area. The amount of food being brought in makes for a very labor-intensive process, which the fork truck makes more efficient, Mararri said. The donation came about when Carl Stitzel, co-owner of Direct Forklift and DEL Lift Rentals, watched a news story about the mission and wanted to help, he said. Initially, he and his business partner, Dave Braun, wanted to make a monetary donation. In December, Stitzel purchased a backpage ad with The Business Journal promoting a campaign to donate to the mission a portion of all lift sales and rentals from both companies during the month. Mararri learned of the ad and campaign and contacted Stitzel to thank him and let him know that, in lieu of a monetary donation, what the organization really needed was a forklift. The fork truck is a Yale MSW040 with a 4,000-pound-capacity, which is the weight of a grocer’s pallet, said Direct Forklift’s Braun. A new fork truck typically sells for about $17,000, he said. The Yale fork truck from Direct Forklift is loaded onto a flatbed truck before being lifted to the receiving dock of the new distribution center for the Warren Family Mission. Donating the fork truck is important because it’s “giving to the people who indirectly support us,” Braun said. The fork truck adds another piece to the puzzle for the mission’s new distribution center, Mararri said. Earlier this year, the mission purchased the 4,200-square-foot building to serve as a food distribution warehouse because it has more space than its main building at 155 Tod Ave. The former post office has double doors and a receiving dock for deliveries and is handicap accessible. A $26,000 donation financed needed roof repairs, but decreasing financial support has proved challenging, Mararri said. Last year, the mission distributed some 12,000 grocery bags of food, down from 17,000 in 2017. Those in need receive one bag of groceries with proper identification. The mission also provides hot meals – about 120,000 served in 2018 – clothing and housing for men and women, he said. As a business owner it’s important to Stitzel to contribute to nonprofit organizations that help area residents who are in need, he said. Stitzel and his employees volunteer at other area food pantries and donated another forklift to a food pantry in North Lima that feeds 600 families monthly, he said. As the Warren Family Mission needs more equipment, he said Direct Forklift will continue to help when it can. “We’ll be routinely involved up here,” he said. Stitzel visited the mission to see what it was doing with the new building and was “immediately impacted by the operation of what we’re doing for the community,” Mararri said. In the early 2000s, Mararri was homeless and struggled with addiction to heroin and crack, he said. Legal issues nearly led to jail time, but the charges were dismissed. That was his motivation to seek help at the Mid-Michigan Teen Challenge in Saginaw, Mich.
“God picked up the pieces of my life and put peace in my heart,” Mararri said. After getting clean, Mararri earned his real estate license and is an agent with Howard Hanna. He holds life and health insurance licenses as well and is pursuing his property and casualty license, and started Senior Care Insurance in Warren, he said. “It’s very humbling to know where I came from and where I am today,” he said. Pictured above: Direct Forklift and Equipment Co. co-owners, Dave Braun (left) and Carl Stitzel (right) were on-hand for the delivery of a fork truck to Warren Family Mission distribution center. They met with the mission’s director of public relations, Dominic Mararri.